Wedding favors add memories for everyone. We specialize in favors ranging from elegant wedding favors and beach wedding favors to unique wedding favors of various themes. Our wedding reception favors include cake tops and garden wedding favors. We also provide bridal shower favors, enchanting heart wedding favors and baby shower favors along with our bridal party gifts. We take wedding party favors seriously! We appreciate your visit today, and look forward to serving you. Need reception finishing touches? How about our cute cake tops or wedding sugar sticks? A new idea for guest books would be our guest book photo albums. You just simply use a Polaroid camera and take photos of your guests as they enter and have them to sign the book. So, no more wondering who is Glen Roberts. Just look at the photo guest book. What about before and after the wedding? We have a nice selection of wedding party favors and placecard holders that would be great at engagement parties or bridal party luncheons. There is a huge selection of baby shower favors for that bundle of joy. From baby shower candles to baby shower candy. Wedding favors that are elegant, trendy or unique and will help create wonderful memories for you and your guests. The wedding favors you choose will give your special day that personal touch with our vast selection to choose from. At Escape Concepts, you will find a wonderful collection of themed wedding favors that are not only perfect for weddings, but also, showers, parties, and corporate events. We carry a huge selection of products that are perfect for themed events, such as the seashell candy and flip flop candles for beach theme wedding favors, or the blooming favors for garden wedding favors . We also have goodies that can fit into any category, such as, the bubblegum buddies, which can be used for any event or theme. Having a holiday bridal shower or bridal shower tea party and looking for the perfect bridal shower favors, bridal shower tea party favors or glamour girl or girlfriend favors? We have them and now is the time to order your bridal shower favors! Some items are only available this time of the year and when they are gone, they are gone! What are some of the best selling wedding favors? Every wedding is as unique as every couple. Escape Concepts has a huge selection of wedding favors, bridal shower favors, and baby shower favors. Sometimes busy brides want to know what some of the best selling wedding favors are because she is running out of time and really don't want to spend the time searching. That is ok because listed below are some of the best selling wedding favors that Escape Concepts has. What are the different themed wedding favors? Another popular trend for weddings is to have a theme wedding. Themes can be based on anything! The colors of your wedding, your favorite flower, your location, special songs, special time periods, seasons, holidays, events, etc. We think that you get the idea! What types of wedding favors or favor packaging is available for DIY? We have many beautiful items that can complete a DIY(Do It Yourself) wedding favor. We have a wide selection of candle favors that can be added to personalized boxes or bags. The soap wedding favors are really cute and would be an excellent choice to complete a gift basket. The confetti daisy favors or long stemmed lollipops can be added to a vase and can be used as a centerpiece. The bulk candies are really beautiful and would add the "special touch" to all wedding favors. There is a large selection of wedding favors packaging for that unique item that you made for your guests! The personalized conversation hearts candy is really cute and can be used in bags, boxes, or just on the tables as table decoration. What types of favors are available for showers? We have a complete line of favors that we have selected that would be great for baby shower favors and bridal shower favors. Try our line of great sachets as shower favors for really close friends. Some of the personalized wedding favors also make great shower favors. If you have already selected your favors and want to package them, we have personalized boxes or bags . Our pink monogram hankies, dress hankies, and wedding hankies are great inexpensive favors for bridal showers. 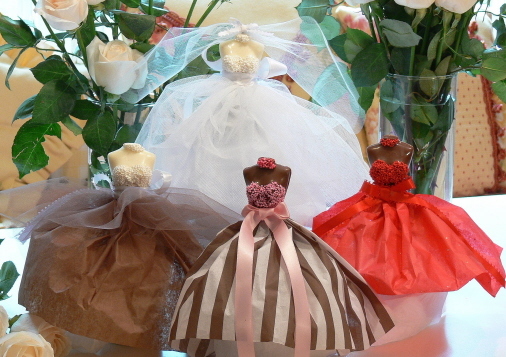 If you are having a tea party shower, we have a large selection of tea party favors and gifts. Some of the cutest tea favors for bridal showers would be the decorated sugar cubes. There are several themes for the decorated sugar cubes: purses and shoes decorated sugar cubes, flip flops decorated sugar cubes, 3-D purses and shoes decorated sugar cubes, & flowers decorated sugar cubes. We also have purse shaped bath oil beads & shoe shaped bath oil beads. You may want to select the imprinted napkins to personalize the event. They are a really inexpensive way to to tie everything together because of the great color selection, clip art selection, and practicality. What types of wedding favors are available for small budgets? Wedding favors do not have to be expensive to be "a really nice" gift. Escape Concepts have a variety of gifts that are inexpensive, yet expressive. The bulk candy is a great way to budget. Go to you local craft store and buy small cello bags, card stock and ribbon. Put a couple of pieces of candy in the bags, print your names and date on the card stock and cut into squares, fold the squares, where your names are on the front. Punch two holes into the paper and bags, thread the ribbon to tie a bow. Simple, inexpensive, personalized wedding favor! Really great personalized gifts that do not require any work, would be the personalized sodas. They average about $2 each with shipping. The personalized crossword puzzles and personalized search-word puzzles are great & at a great price! Use your wedding favors as a part of the table decorations to cut costs. Put the flower pens or confetti daisies in a vase in the center of the table. Instruct your guests to "pick one" at the end of the reception. Place card holders are decorative, functional, and make great gifts. How is it a wedding favor? Placecard holders make great picture holders. Your guests can take them home and put their favorite photo of you in the holder. That way they will remember the wedding and see your smiling face. Just be creative when you are choosing your wedding favors. Always check the bargain basin for closeouts. What types of wedding favors are recommended for splurging? If you are having an intimate wedding or "this is my dream wedding", we have the perfect wedding favors for you. Our Parisian Chair Sachets used as a placecard holders would be fabulous wedding favors! Instruct your guests to "take a seat". The Aroma Naturals Candles are great! They smell wonderful and burn 60 hours! The drop tea and heart shaped sugar wedding favors are unique. They will just gasp when they see them.